by L. C. Tyler | Mystery & Thrillers | This book has not been rated. Thank you for picking up this book and logging on to the website, I hope you enjoy reading it, when you have finished it please make a journal entry so that I know what you have decided to do with the book next. If you decide to join BookCrossing (it’s free and completely private your e-mail address is never given out) please say yorkshire-lass sent you. Happy BookCrossing! This is on its way to a Bookcrossing friend as an Easter gift. I just love the characters. Elsie's snarky remarks & the overall wit are just to my taste. For me the writing has a rather timeless quality about it, apart from the rare mention of the internet & google, it could almost be set at any time in the past five or six decades. 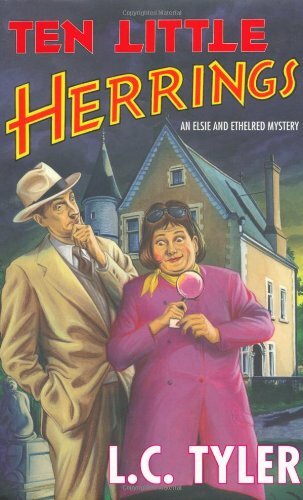 Still my judgement may be clouded by my book’s cover picture, as that, along with the names Elsie & Ethelred, give things a bit of a 1950's vibe to me. Anyhow that's pretty irrelevant…..although I would really like to know how old are they supposed to be. I did think this story had a touch of the “Agatha Christies” about it. Perhaps it was the title itself, or the setting of a continental hotel with a mixed bag of residents, or maybe it was the way Elsie gathered everyone in the dining room to reveal the murderer(s)…even if she didn’t do it all that successfully! It was lovely to see you again - and to meet your husband. Any excuse for a trip to my favourite city! Really rather silly but highly entertaining and I've already added other titles in the series to my wish list. Hadn't met Elsie and Ethelred before but would happily meet them again! My thanks and greetings to Plum-crazy and yorkshire-lass :-) Now where? This is one of three books I swapped in this red telephone box community library during a lovely dancing holiday near Grange-over-Sands. Well over a million people around the world give their books a unique BookCrossing IDentity number (BCID) before sending them out to find new readers. Since the start of the scheme in April 2001 over twelve million such books have been put into circulation. This is one of them! Our hope is that we can track the progress of our books once they've left our hands - and that's possible if finders like you visit the website, key in the BCID and leave a comment, however long or short. It's fun, it doesn't have to cost anything, although the site always appreciates donations towards running costs, and you can remain anonymous if you wish. You don't have to join but if you do you'll be able to number and track your own books!